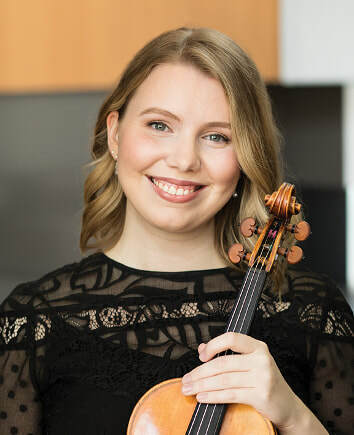 Violinist Sarah Grimes, a native of the Twin Cities, joined the Minnesota Orchestra in 2016, where she is a member of the first violin section. During the 2015-16 season, she performed full time as a Guest Musician with the Saint Paul Chamber Orchestra. A graduate of the Northwestern University Bienen School of Music and formerly a member of the Civic Orchestra of Chicago, Grimes was concertmaster of the Northwestern Symphony Orchestra, performer and cofounder in student-led ensembles, and a freelance musician in the greater Chicagoland area. She appeared as a soloist with the Minnesota Orchestra in 2005 and 2010 and with the Minnesota Sinfonia in 2012. As a chamber musician, she performed recently for the Minnesota Orchestra Chamber Music Series, Liquid Music Series, the SPCO Chamber Music Series, The Musical Offering, and at festivals including Kneisel Hall Chamber Music and Astona International.